S.M.A.R.T began operating in New South Wales in March 2011, with the opening of its first centre at Seven Hills in Sydney. An existing collisions repair business was converted to incorporate S.M.A.R.T practices, with the majority of the team members moving across from the old business to S.M.A.R.T. 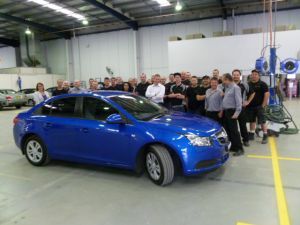 To ensure that the New South Wales operation was able to replicate the customer experience enjoyed by clients in Victoria, South Australia and Western Australia, a number of the New South Wales team spent time in Melbourne to gain an understanding of the timely and efficient collision repair processes which have been developed by S.M.A.R.T. Capital S.M.A.R.T Repairs Chief Operating Officer and Director, Jim Vais, said he was delighted that the new team members at Seven Hills had embraced the technology, innovation and training. "We are confident that our Seven Hills facility provides customers in New South Wales with an outstanding product and exceptional service." Mr Vais said.